State highway routes embracing portions of I-280, Route 82, Route 238, US 101, I-5, Route 72, Route 12, Route 37, Route 121, Route 87, Route 162, Route 185, Route 92, and Route 123 and connecting city streets and county roads thereto, and extending in a continuous route from Sonoma southerly to the international border and near the route historically known as El Camino Real shall be known and designated as "El Camino Real." State highway routes embracing portions of I-280, Route 82, US 101, I-5,and Route 72, and connecting city streets and county roads thereto, and extending in a continuous route from San Francisco southerly to the international border and near the route historically known as El Camino Real are known and designated as "El Camino Real." Note that there are other routes that are part of El Camino Real, most significantly San Diego County Route S11. Note: KCET has a very nice "LA as Subject" piece on El Camino Real. San Francisco de Solano (Sonoma Mission) (1823). Sonoma County. San Rafael Arcángel (1817) . Marin County. San Francisco de Asís [also known as Mission Delores] (1776). San Francisco County. San José (1797). Alameda County. Santa Clara de Asís (1777) Santa Clara County. Santa Cruz (1791). Santa Cruz County. San Juan Bautista (1797). San Benito County. San Antonio de Padua (1771). Monterey County. Nuestra Señora de la Soledad (1791) . Monterey County. San Miguel Arcangel (1797). San Luis Obispo County. San Luis Obispo de Tolosa (1772). San Luis Obispo County. La Purísima Concepción (1787). Santa Barbara County. Santa Inés (1804). Santa Barbara County. Santa Bárbara (1786). Santa Barbara County. San Buenaventura (1782). Ventura County. San Fernando Rey de España (1797). Los Angeles County. San Gabriel Archangel (1771). Los Angeles County. San Juan Capistrano (1776). Orange County. San Luis Rey de Francia (1798). San Diego County. San Diego de Alcalá (1769). San Diego County. El Pueblo de San Jose de Guadalupe (1777). Santa Clara County. El Pueblo de Nuestra Senora la Reina de Los Angeles (1781). Los Angeles County. El Presidio de San Francisco (1776). San Francisco County. El Presidio de Monterey (1770). Monterey County. El Presidio de Santa Barbara (1782). Santa Barbara County. El Presidio de San Diego (1769). San Diego County. As I noted, this is a "legend". The KCET piece on El Camino Real notes that message implied by the formal "El Camino Real" (i.e., that the route is exactly the same one that the missionaries used) is largely a myth imagined by regional boosters and early automotive tourists. The route of the actual El Camino Real that helped link the presidios (military forts), pueblos (civilian towns), and religious missions was not fixed; the actual path changed over time as weather, mode of travel, and even the tides dictated. Furthermore, while the road provided local transportation links between colonial settlements, the primitive highway was eclipsed in importance by a water route between Southern and Northern California. Further, although local segments of El Camino Real were still heavily used, the route as a whole had faded into obscurity. El Camino Real started in San Diego, in what is now Presidio Park, near the current SE corner of Taylor St. and Presidio Drive in San Diego (see California Historic Landmark #67). Over time, the original El Camino Real routing was replaced by modern highways, primarily US 101. US 101, overtime, has also been replaced in portions by I-5, Route 72, Route 82, and I-280. From Los Angeles El Camino Real leads to Hollywood, through Cahuenga Pass to Sherman Way thence to Mission San Fernandor from Sherman Way to Calabasas, Camarillo, Ventura, Santa Barbara, Gaviota, Mission Santa Ines, Mission La Purisima, Los Olivos, Santa Maria, San Luis Obispo, Paso Robles, San Miguel, Jolon, Mission San Antonio, Soledad, Salinas to Monterey and Mission Carmel, or from Salinas to Mission San Juan Bautista, San Jose, Mission San Jose, Hayward, San Leandro, to Oakland from San Jose to Santa Clara, Palo Alto, Redwood City, San Mateo, Colma, Ocean View, to Mission de los Dolores and San Francisco (Market and Third Streets). Across the bay, El Camino Real leads from San Rafael to Mission San Francisco Solano in Sonoma. The notion of preserving El Camino Real was first proposed by Miss Anna Pitcher, Director of the Pasadena Art Exhibition Association to the Women's Club of Los Angeles in 1892. The factors driving the preservation were, first, the rise of the automobile, which created a small but influential group of wealthy Californians who clamored for a well-maintained state highway. The second factor was a reinterpretation of Spanish colonial California as a romantic paradise, fueled by the 1884 publication of Helen Hunt Jackson's "Ramona" and set within a broader cultural embrace of Southern California as a American Mediterranean retreat. Regional boosters saw California's missions -- some of which still functioned as parish churches, but many of them long-neglected and crumbling into ruin -- as a place where tourists could commune with California's romantic past from the comfort of their modern machines. These boosters invented sentimental stories about Franciscan fathers traveling along the road from mission to mission, which were supposedly spaced one day apart along the trail. Unsuccessful, she tried again with a pitch to the California Federation of Woman's Clubs (CFWC) in May 1902 and to the Native Daughters of the Golden West (NDGW) in June 1902. Both organizations endorsed the idea. The CFWC (principally Mrs. A.S.C. Forbes and Mrs. Caroline Olney) and the NDGW eventually implemented the proposal. In 1904, a group was formed called the El Camino Real Association. This group had the mission to mark the historical route, promote tourism along the road, and lobby for government support. The actual, historical route -- which had shifted many times, in any case -- often evaded the association's trackers. Mrs. Forbes' (upon a suggestion by Mrs. C.F. Gates) created a marker that was a cast iron bell hung from an eleven-foot bent guidepost. The first bell was placed in 1906 in front of the Old Plaza Church in downtown Los Angeles. Eventually, there were approx. 158 bells installed along the Camino Real by 1915 (AAA states the number is closer to 400). The bell marker was fashioned after those at Los Angeles' Plaza Church, and hung from a pole resembling a shepherd's staff. The markers were the design of Forbes, who with her husband owned the only bell foundry west of the Mississippi. Alas, the bells were not maintained, and by 1926, the bells had fallen into disrepair and some had been stolen. From 1926 to 1931, the California State Automobile Association and the Automobile Club of Southern California assumed responsibility for maintenance and replacement of bells on state-owned property (just as they had responsibility for signage). In fact, the bells often served as highway signage, working as markers for California motorists. By 1949, there were approx. 286 bells along the road. The roadway itself fell short of expectations at first. While the 1910 State Highways Act authorized construction of a paved road along the route of El Camino Real, construction lagged and for many years much of the historic road was only a primitive trail. Between cities there were streams to ford and steep grades to scale. Sometimes, teams of horses would rescue automobiles trapped in mud. Finally, by the mid-1920s, the highway construction was complete, and in 1925 the route was signed as US 101. In 1960, Justin Kramer of Los Angeles won the bid to manufacture replacement bells. His design became the standard. Theft and vandalism continued to take its toll, and the number dwindled to about 75. In 1974 the Legislature appointed Caltrans as guardian of the bells, responsible for repairing or replacing them. Replacements are made of concrete, rather than cast iron, to discourage theft. Along with Los Angeles County, the bells are located in the counties of Ventura, San Benito, Monterey, San Luis Obispo, Santa Barbara, San Mateo and Santa Clara. In 1996, Caltrans developed the "Adopt-A-Bell" program (specifically, it was developed by Keith Robinson, who was the Statewide Coordinator of the Caltrans Adopt-A-Highway Program because he had an interest in El Camino Real and the loss of the mission bell markers; it appeared to him to be a good way to get the bell markers back on the highways for the public to recognize the historic route of El Camino Real). After the program was conceived, the California Federation of Womens Clubs was offered the opportunity to adopt as many bells as they could until early 1998. The adoption guidelines were written so that after early 1998 anyone could adopt a bell and maintain it under the Adopt-A-Highway Program. Up until 2006, the CFWC continued to work to place more bells on El Camino Real in California. Also working on the program were the Automobile Clubs of Northern and Southern California, the Knights of Columbus, The California Sister Cities Program and Various sites in Baja California. In October of 1997, a special bell was erected at Loreto, Baja California Sur, the site of the very first successful mission to be established in the Californias, thus marking the site of the very beginning of El Camino Real. In June of 1998, the California State Dept. of Transportation and the Mexican National Institute of Anthropology and History, in conjuction with CFWC and The Knights of Columbus, dedicated a bell on the international border at the San Ysidro/Tijuana crossing. 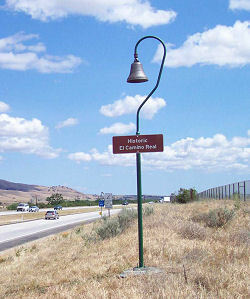 In 2000, Keith Robinson, Principal Landscape Architect, Landscape Architecture Program Division of Design of Caltrans applied for and received a federal grant in 2000 to restore El Camino Real Mission bell marker system on the state highways. This grant allowed Caltrans to install bells every one to two miles along El Camino Real from San Francisco through Orange County. San Diego County was not included in the grant as El Camino Real is not on the state highway system within the county. The bells, manufactured by California Bell, were cast from a mold made from one of the original bells installed before 1910, they are an exact copy of the original bells, unlike the bells installed on or near El Camino Real by the CFWC and others. As of July 2004, 370 new bells have been erected in San Benito, Monterey, San Luis Obispo and Santa Barbara Counties. Two additional contracts were in Los Angeles & Ventura Counties (115 bells are being installed) and San Mateo & Santa Clara Counties (70 bells are being installed). All told, 555 new bells will have been added to the El Camino Real Mission Bell Marker System -- the installation was completed in June 2006, just in time for the 100th anniversary of the installation of the original bell in 1906. The bells are placed on both sides of the highway at approximately 1-2 mile intervals. In locations where Caltrans could not find a safe place to install the bells they were not erected - creating a longer gap between bells. The picture (taken by SLO Richards, and used with permission) shows the a new bell, installed on Route 101 near Camp Roberts. The first bell for the contract was placed in Monterey County just North of Salinas along Southbound US 101. In June 2011, the CTC approved $161,000 to make and install 40 Mission Bell markers along US 101 in the Santa Rosa and Rohnert Park areas and on Route 12 near Sonoma. In May 2012, it was reported that even the new bells are the subject of theft. Mission bells along Highway 101 at Seaward Avenue, Telephone Road and Main Street in Ventura were reported stolen in Apri 2012. Measuring 18 inches in diameter and usually weighing 85 pounds, the bells are mounted on 15-foot-tall posts attached to concrete foundations. The stolen bells cost about $2,700 each to make and will be replaced. There is also excellent information in the book California's El Camino Real and Its Historic Bells by Max Kurillo and Erline Tuttle (Sunbelt Publications). El Camino Real de Tierra Adentro. This 1,800 mile trail goes from Mexico City to Santa Fe, New Mexico. In the United States, this route runs along approximately I-25 between El Paso TX and Taos NM. El Camino Real de los Tejas. El Camino Real de los Tejas and variations in the primary route were used for more than 150 years as the principal route between Mexico City, Saltillo, Monclova, and respective presidios, and the missions near the present Guerrero, Coahuila, Mexico, on the Rio Grande and Los Adaes in what is now northwestern Louisiana. El Camino Real Bell. From Casey Cooper's Finding US 101 <http://www.gbcnet.com/ushighways/US101/US101.html>.